'New Yorker' Artist Shares His Cover Stories Barry Blitt's new book features some of the cartoonist's most memorable and merciless work, including his 2008 drawing of Barack and Michelle Obama fist-bumping in the Oval Office. We all remember the campaign of 2008. When Obama was running for president, there was a lot of stuff being said about him and Michelle. 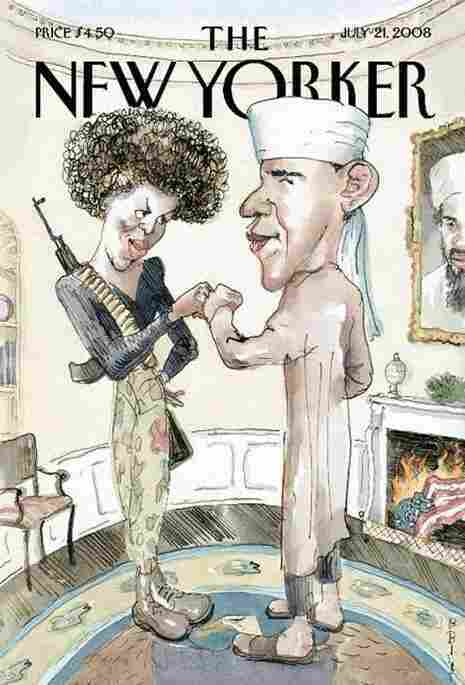 It was whispered and insinuated ... that he was a terrorist, that Michelle was some kind of Black Panther or something. There [were] rumors of a video of her saying, "Kill whitey." I mean, I just scribbled in a sketchbook all of it in one picture, and I threw in a burning American flag and a portrait of Osama bin Laden on the wall of the Oval Office. ... I had Michelle dressed as, you know, she had a gun on her back and she was sort of like a, I don't know, a fictional Black Panther. It was a ridiculous picture and I hoped it would be seen as such. I thought it was obviously satire, but not everyone felt that way. I mean, the picture still makes me laugh. I don't regret it. One of the main criticisms of it was that people would say, "Oh, I get it, but what are those other people going to think?" which, you know, seems kind of condescending to me. Barack Obama was interviewed about it and was disgusted, and so was John McCain. You know, Rush Limbaugh. Couple of days in, Jon Stewart on The Daily Show talked about it, about how ridiculous the reaction was. And it seemed to turn to love after that. I think people took a breath and realized this wasn't going to cost anybody the election and it was just a cartoon. Obviously that came from Spy magazine — they started calling him the "short-fingered vulgarian." It seemed like a nice way to not only taunt him, you know, and say he has short fingers, but I used a palm chart so I could write stuff about him onto the palm. So it's got stuff like, on his lifeline, "Gonna live a long time. LONG. Very, very healthy." And line of intellect: "Fantastic. Continues onto back of hand." And, of course, "Beautiful singing voice (you'd be surprised)." So it was sort of funny to write in his voice, so to speak. ... I mean I learned a whole bunch about palmistry by doing this. I tried something with a couple of would-be terrorists on an airplane, and one of them has a can of Diet Coke and the other one has some Mentos, and he's slipping the Mentos to the guy with the Diet Coke. And I guess not everyone gets that reference. ... It didn't run, but it got some laughs. And really, what more can we ask? 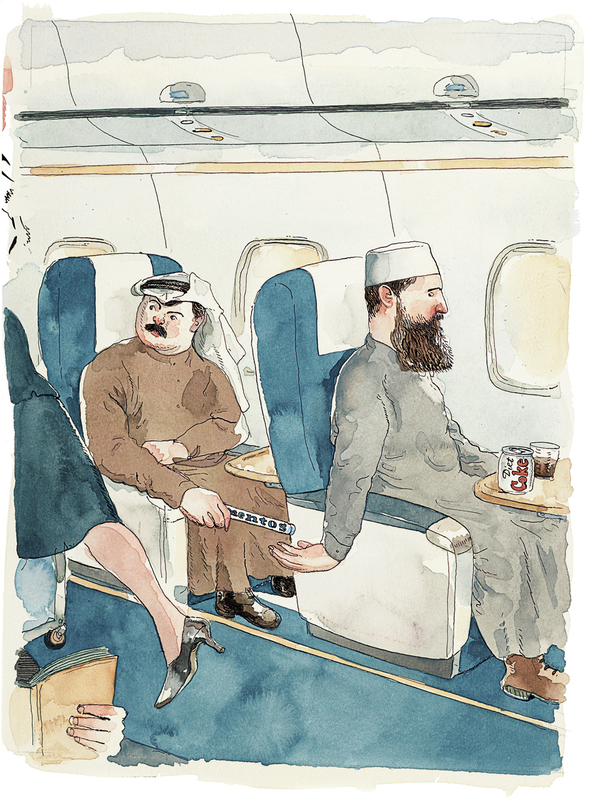 Blitt says his cartoon of two would-be terrorists with Mentos and Diet Coke didn't make it into the magazine, "but it got some laughs." Melissa Gray and Jolie Myers produced and edited this interview for broadcast, and Nicole Cohen adapted it for the Web.